GCW Resources / Uncategorized / Black River Leathered Kitchen. Looks totally awesome. Check out this beautiful kitchen that Granite Countertop Warehouse fabricated and installed in Mableton, Georgia. Dan Harper, one of our expert designers put together this striking kitchen with Black River Leathered stone. Special care was taken in choosing a slab with the right kind of patterns. Notice how the grayish white pattern in the stone complements the colors of the rest of the kitchen. The backsplash is in harmony with the countertops. The grey, white and black in the backsplash, in concert with the Black River Leathered, give this kitchen a modern look and appeal. 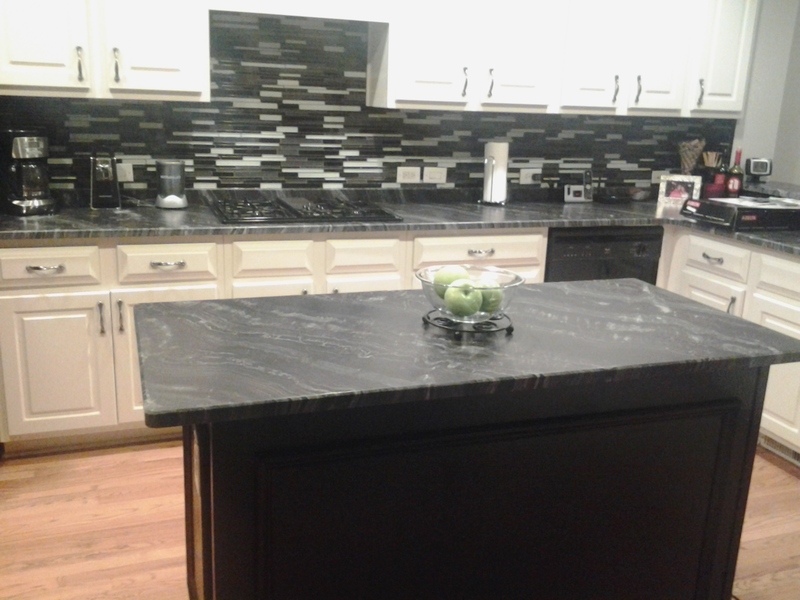 The Black River Leathered granite looks great next to the off-white cabinetry. When you walk into the kitchen, the first thing that catches your eye is balance of color between the cabinets, the backsplash and the black granite countertops. The colors are well defined and do not get lost in any clutter. A very important component in making this kitchen a success is the craftsmanship in the installation. Our chief installer Derrick Fortune and his team take great pride in bring the whole project together. When you install granite countertops, experience and knowledge always win out. Having installed thousands of kitchens, our installation team still get excited after every install. If you would like to speak to Dan about your particular project, call him at 404-592-5599 or set up an online appointment for a free consultation.